Giving Hope Lawn Management offers professional french drain design and installation services. We offer free consultations and quotes. To get your free quote call us today. Many lawns have pooling water or even dry spots where the grass stays dehydrated. But when you notice that happening in your yard, you may not know what the solution is that you need. Some think it’s a problem with their sprinkler systems. But after they spend the money to have it serviced, they learn it isn’t the source. Instead, many people struggle with how poorly their yards drain. They discover that they require grading or even yard drains to promote better water use. Whether your grass requires standard lawn drains or more complex French drains, you need an expert team that can handle it all. For the best in Richmond, VA, yard services, Giving Hope Lawn Management is the best choice. Don’t allow poor drainage to prevent you from the lawn you deserve. Call today for your best new drain installations! The first step of any installation is proper planning. And when it comes to installing a French drain system, you must work out the details first! French drains rely on trenches and usually happen around a building’s foundation. Because you don’t want to damage the concrete slab unintentionally, you need an experienced service to handle your project. 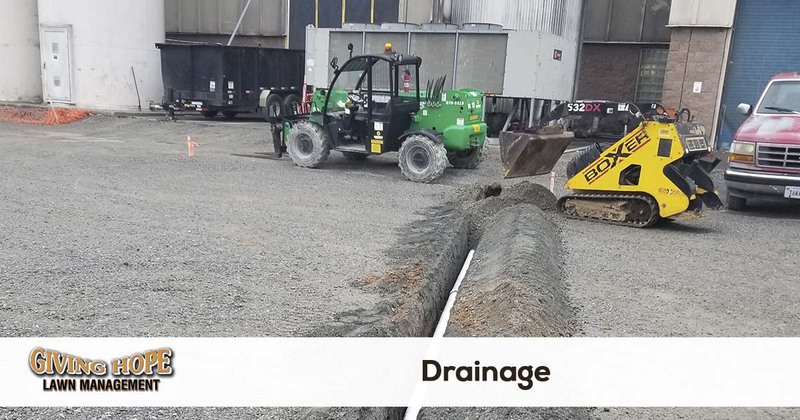 Once we know how your new drains will operate, we can start the installation stages. Whether a standard yard drain is right for you or you need an advanced French drain system, we ensure the best installation each time! Call now to start designing your yard’s new drains. We guarantee better results when you hire us! Installing a new lawn drain is one of the trickier landscaping solutions that we offer. Whichever type of system is best for your grass, we promise better installations each time. Your new system depends on underground piping and new trenching. That way water has somewhere to go both above and below the ground. Whether you have pounding rain or low points in your yard, your new system will promote better grass growth and healthier plants. You no longer have to worry about dry grass and soaked roots again! Make sure that your yard is receiving the best care possible. Call us today for your best yard drain installations! A top concern of moisture runoff should be preventing water from your home’s foundation. The most efficient way to avoid foundation issues is with a French drain system. Using a trench with drain pipes and coating it with gravel, these drain types are ideal for walls, hardscaping, and other concerns. And because it’s built to use gravity to promote better drainage, you never have to worry about inefficient draining. These are more advanced than typical storm drains. Make sure you call the team that has the experience you need! No matter what your yards need to promote complete draining, the team behind Giving Hope Lawn Management get the results you need. Call today for your best new drain system and save! Ready to have drainage installed on your property or just need a quote? We make it easy to get a free quote and schedule your service. All you need to do is request a quote online or give us a call today!